The Arkansas Department of Corrections reports that there are almost 18,000 prisoners in the state. For a state of our size, this is a huge number. One reason is that released prisoners are more likely to reoffend here than in other states. This is known as our “recidivism rate”. One cause of our high recidivism is Arkansas’s occupational licensing requirements. Arkansas has much stricter occupational licensing requirements than many other states and our licensing boards have a lot of power to discriminate against ex-prisoners. In ACRE’s newest policy brief, “Second Chances: The Importance of Occupational Licensing Reform to Arkansas’s Criminal Justice Reform Initiatives”, Stephen Slivinski, senior research fellow at the Center for the Study of Economic Liberty at Arizona State University, and Thomas Snyder, associate professor of economics at the University of Central Arkansas and an ACRE scholar, take a close look at the relationship between Arkansas occupational licensing laws and crime recidivism. Arkansas is 1 of 3 states with the heaviest licensing burdens for low to moderate income occupations. These are the occupations mostly likely to be labor market entry points for ex-offenders. States with heavy occupational licensing burdens have increased recidivism over time. Meanwhile, states with light burdens have decreased their rates of recidivism. Slivinski and Snyder use data and analysis to predict that if we in Arkansas had lowered our licensing burdens to that of Kansas or Missouri, our crime recidivism rate would have fallen by 17.5% in 5 years. Arkansas’s 1973 “general rehabilitation” law was meant to ensure that the state did not discourage employment for ex-offenders. But that law has been hampered by political pressures and judicial decisions. Returning to the original intent of the “general rehabilitation” statue would help ex-offenders break free from cycles of crime. It would also protect Arkansans from future crimes and higher taxes. You can find instructions on how to get a print copies here. 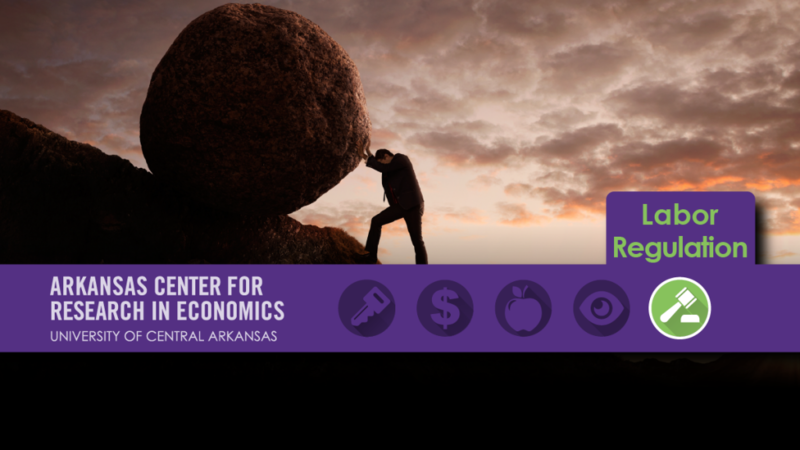 To learn more about occupational licensing in Arkansas see my latest op-ed, “Lower the Barriers” and Snyder’s co authored policy review, “Unnatural Rights in the Natural State.” You can also find more at ACRE’s page on Labor Market Regulation. Stephen Slivinski also presented his research at UCA last year in a talk entitled, “Weighing Down the Bootstraps” which was a part of ACRE’s Distinguished Speaker Series.